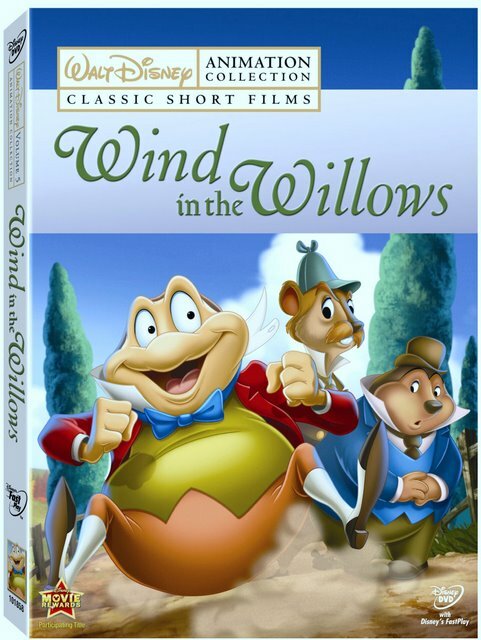 A childhood favorite both in Kenneth Grahame's irresistible novel and the Walt Disney short form--especially when paired with its companion short about Sleepy Hollow's Ichabod Crane in the original '49 feature length work The Adventures of Ichabod and Mr. Toad-- the fifth volume in Walt Disney's new Animation Collection of Classic Short Films presents Wind in the Willows in a gorgeously packaged, inexpensive DVD complete with a collectible Litho Print. The action packed tale follows the mischievous adventures of-- as our narrator (Basil Rathbone) describes-- Grahame's "fabulous" and "foolish" hero J. Thaddeus Toad. Voiced by Eric Blore, Toad is the lovable dreamer whose tendency towards mania in his pursuit of the next great thing (from a horse and carriage to a motorcar or plane) has not only jeopordized his fortune as the owner of Toad Hall but has also driven his worried friends to try and stage a Disney-fied intervention before it's too late. After his dedicated accountant Angus MacBadger (Campbell Grant) realizes he's heading into financial ruin, Toad's two closest friends-- the stuck-up Rat (Claude Allister) and the dim yet sweet and loyally "true blue" Mole (Colin Campbell)-- are called into action. When they can't persuade Toad to give up his brand new cart and "noble steed" Cyril Proudbottom (J. Pat O'Malley) who calls himself "a bit of a trotter; a bit of a rotter," Rat and Mole decide that the only thing left to do is lock Toad in his chambers especially when they notice a feverish look on his face and daring twinkle in his eye as he spots an impressive motorcar off in the distance. Yet, when Toad is driven to drive, there's simply no stopping him as he busts out of Toad Hall and sets off to get his own flashy set of wheels before he quickly lands in the clink, setting Willows into a chain of even wilder events as they all try to get to the bottom of just what happened when Toad hit the road. While the film is still great fun, the extraordinarily timely financial matters concerning impulse buying and dissatisfied owners who've just got to have the next great thing make it a great moral teaching tool-- even if this won't be apparent to the youngest Disney viewers. And although unfortunately the picture quality isn't quite as sharp as it could be in a soft and dated visual presentation complete with a bit of an audible "thhhhhhh" heard immediately on the soundtrack which-- instead of wind-- makes discerning some of the nuances in the voices a bit difficult, the film's musical accompaniment is first rate. Indeed it's the sound that reigns supreme on the rest of the Walt Disney's "Silly Symphonies" included via much shorter bonus animated classics (all falling under a dozen minutes max) on the disc. From the adorable heartrending perfection that is Ugly Duckling about that one white baby duck whose appearance and loud "honk" just doesn't fit in with the rest to the extremely musical Goofy-esque The Grasshopper and the Ants that's filled with intricate eye-popping animation (beautifully and completely in sync to the music)-- the collection's selections are diverse and consistently entertaining. Also boasting The Robber Kitten, The Wise Little Hen, and The Golden Touch-- this Disney Fast Play equipped DVD zooms right from the previews throughout the rest of the shorts in a kid and parent friendly approach that doesn't annoyingly deliver you back to the main menu after every single work. Overall, it's enchanting installment in the Classic Short Collection which makes it of particular value for Disney enthusiasts, despite my wish that it would've been paired with Ichabod once again and remastered to superior effect. Still, it's a great one to add to the growing library of titles in this new series and a "fabulous" reminder of just how fabulous J. Thaddeus Toad was... unless-- of course that is-- you happened to be operating a piece of transportation he was dying to get his hands on.